From a young age, Becky loved to challenge herself. As soon as she would complete one challenge, she found another. Becky served in the United States Marine Corps, received her master’s degree, and worked full-time in public service for 17 years. During that time, Becky has also had numerous unexpected challenges to overcome. She was diagnosed with Hodgkin’s Lymphoma twice and Esophageal Cancer but there is no challenge Becky can’t conquer and she overcame cancer all three times! Unfortunately, the repeated cancer treatments left Becky with many side effects and disabilities which resulted in her life changing dramatically. She is often fatigued and nauseous. She has a paralyzed vocal cord which results in a soft, raspy voice but the most difficult challenge has been a condition she developed called Orthostatic Hypotension which causes her to have sudden drops in blood pressure resulting in a loss of consciousness. When Becky loses consciousness, she often falls and injures herself which has led to many hospital stays. She had to stop working and became reliant on her family and friends to care for her. One day, while watching the National News, Becky saw a story about a woman who had a dog that alerted to her low blood pressure. The story immediately piqued Becky’s interest and she began to research service dogs. Becky said, “I felt like it was too large of a burden for my family to feel like they couldn’t leave me alone due to being afraid that I would fall again and harm myself. 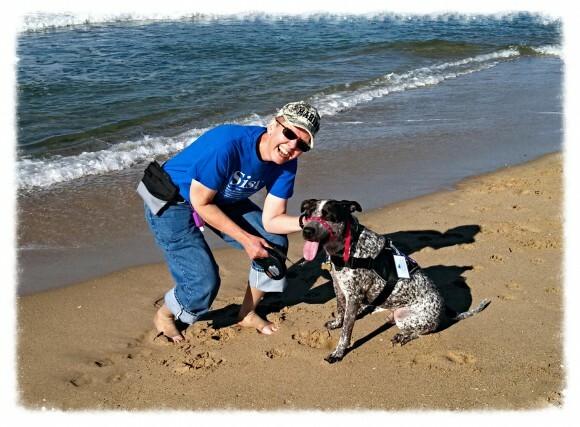 I figured a dog would allow me some more independence, while reducing the strain on others to continually monitor me.” Her research brought her to Canine Partners for Life and she was matched with Yankee in the fall of 2013. In Becky’s application to CPL, she expressed that she wanted a dog that would have the ability to alert to her drops in blood pressure which would help her do more activities independently and free up her family or “human monitors”. Yankee has achieved that and more! He alerts to Becky’s low blood pressure by nudging her knees. This gives Becky time to sit down or kneel down which prevents her from losing consciousness. Yankee will alert until Becky sits down and then will lie next to her until it is safe for her to stand up. Since receiving Yankee, Becky has not had any falls requiring hospitalization. Yankee also provides Becky with assistance while walking. Before Yankee, Becky was extremely fatigued and would need to use a walker on most trips. 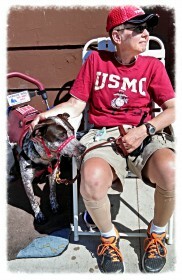 Now, Yankee provides support and even “pulls” Becky along which helps to reduce her fatigue. Becky is able to walk independently and travel again. They even spend half of the year living out of a camper visiting new locations and meeting new people! One of their favorite trips was to Luray Caverns in Virginia. Yankee pulled Becky through the caverns, assisting her up the hills and providing balance on the downhills. Becky said Yankee even seemed to enjoy the tour and would often be seen peering over the railings admiring the beauty and expanse of the caverns. These two continue to find new adventures and Yankee has allowed Becky to once again challenge herself each and every day. Becky says, “Every time I can get out of the house and participate in things I enjoy, it illustrates how CPL and Yankee have changed my life.” We can’t wait to see where these two travel next and look forward to their next trip to CPL!